Seven is the number; the number that has filled Nigeria with pride. On Friday 12th August, in Riocentro Pavilion 3, Segun Toriola was recognised for his outstanding achievement of competing in his seventh consecutive Olympic Games. He stood proudly alongside Belgium’s Jean-Michel Saive and Croatia’s Zoran Primorac whilst Jörgen Persson, the one other player to have enjoyed the same number of appearances, sent a message of congratulations displayed on the video screen. 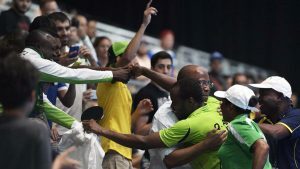 Equally, the efforts of Quadri Aruna have been one of the highlights of the first seven days of action, a quarter-final place in the Men’s Singles event followed by the audacity to extract a game from Ma Long in the first round of the Men’s Team event, have sent the supporters of the country with seven letters in the name into seventh heaven. Understandably, Wahid Oshodi, the President of the Nigeria Table Tennis Federation is a proud man. He spoke to Olalekan Okusan, the Press Officer for the African Table Tennis Federation. “I am pleased with the players. They have shown commitment and have strived to give their best. Everybody won a match and got into the main draw of the tournament, at this level that is not an easy task. They have all come together and supported each other even when support seemed to be lacking from the Ministry of Sports. With Quadri Aruna’s excellent performance in reaching the quarter-final and Segun Toriola getting to the second round, I must confess that I am quite elated and proud of this team. They have done the country proud. This is by far the best performance by a table tennis team outside Asia and Europe ever and must be celebrated. If you also look at the quality of players that we defeated then one must take his hat off to the players. It is a phenomenal performance taking all the circumstances of our preparation into consideration. It just goes to confirm what we know about our players. They have the talent and if you can combine that with hard work, commitment to your job, discipline and a lot of humility then you can get to the top of the world game. We have a lot of gifted players in Nigeria but what is lacking in many of them is the willpower to put in the work. Segun Toriola, Quadri Aruna, Bode Abiodun, Edem Offiong and Funke Oshonaike continue to show the way and I hope many others will follow. We have probably the best crop of young junior players outside China and Japan and if we can harness their talents properly then I make bold to say that in the next five years we can challenge the Chinese for the number one spot. Our problems like lack of funding, lack of seriousness and the right kind of exposure for our coaches and players still continue to hamper us. As you know I have always taking an extra interest in Aruna’s career due to his hard work and commitment to improving himself both on and off the table. I am the proudest person in Rio. Everybody who has followed his career will feel rightly proud. The NTTF is really proud of Aruna and his team mates. This performance gives us another platform to engage with the private sector and I truly hope that with all the accolades and acclaim he is receiving from home and abroad the private sector in Nigeria will see fit to support him as Frot Group, Friends of Table Tennis and Premier Lotto have done. Aruna goes on to the World Cup in October and of course the African Senior Championships later in the year and he needs to sustain this performance. Playing alongside the best players in the world requires a lot of funding for training travel and equipment. We hope our own home grown companies, philanthropists and wealthy individuals will come forward now and help this talented player get to the top of the game. Aruna and Toriola are probably some of the most famous faces in world sport today and it is sad that we keep going on about lack of funding. I really hope this will change for the better. There is need for more exposure for our other players and coaches while more funding, increased and better quality coaching. We need to have at least eight male and female players consistently playing on the senior and junior professional tours. This will serve as an inspiration for the young ones coming behind, especially when they see that they can build a financially rewarding career as people like Toriola and Oshonaike have done. I have learnt in my career that the only true reward for hard work leading to success is more hard work. We need to even work harder especially in the female category so we can sustain our achievements. I am fully committed to helping our players get to the top and really hope we can get the right support from government and the organized private sector such as the banks, telecoms and oil companies and our big Industrialists: this category of organizations need to focus a lot more on helping our home grown sports stars develop instead of chasing after the big earning Premiership football stars. What they spend on just one of these sponsorships could easily cater for all of international and local table tennis for a year. The people who decide what these companies expend on corporate sponsorships need to sit back and have a rethink. We really hope they will get behind our players and only when they do this will they be really doing some good in society.